The ten largest aluminum refiners accounted for over 20 million metric tons of production in 2011 or about half the total global output of the metal. The list below is based upon output from mines according to research done by the consulting company CRU. Production figures - shown beside each company name - are in thousands of metric tons. Rusal was founded in 2000 and, following its merger with SUAL and the acquisition of alumina assets from Glencore, became the global aluminum industry leader in 2007. The company currently operates 15 alumina smelters, 12 alumina refineries and owns eight bauxite mines. Rusal has a production capacity of 4.7 million tons or 9 percent of global production. 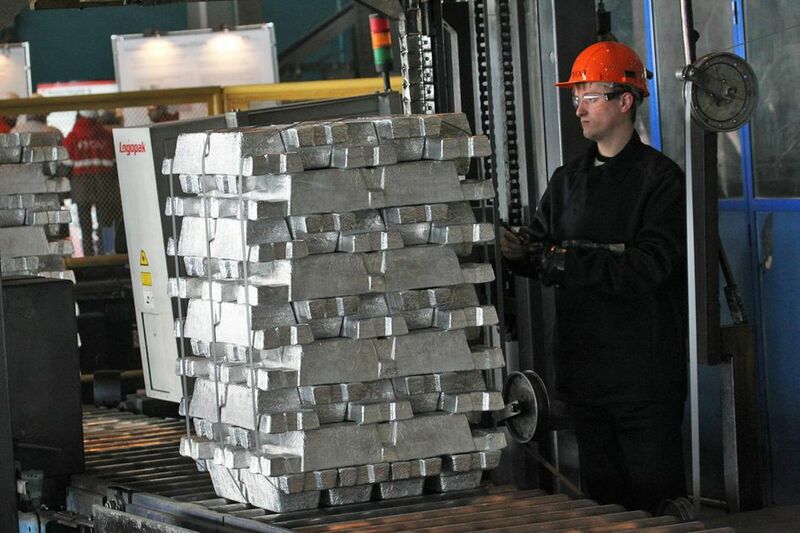 Rio Tinto produced nearly 4 million metric tons of refined aluminum in 2011. The company owns and operates bauxite mines and alumina refineries in Brazil, Australia, Guinea, and Canada. Its primary aluminum smelters are located in Canada (8 smelters), Cameroon, France, Iceland, Norway, and the Middle East. In order to power its smelters, Rio Tinto owns 11 power stations, which supply 36 percent of the electricity the smelters consume. Aluminum assets include Queensland Alumina Ltd., Kitimat and Alouette smelters (Canada), the Dunkerque smelter (France), ISAL (Iceland), and Sohar (Oman). Alcoa's operating income was US$ 1.06 billion in 2011, while the company employs over 61,000 staff. Key aluminum assets include the Fjardaál smelter (Iceland), Alcoa World Alumina and Chemicals (Australia), the Baie-Comeau and Becancour smelters (Canada), as well as the San Cibrao smelter (Spain) and smelters in Newburgh (Indiana), Ferndale (Washington), and Rockdale (Texas). The company employs over 100,000 individuals and also has operations related to copper refining, carbon products, gallium, and rare earths. Major aluminum assets include the Shandong Aluminum Company, Pingguo Aluminum Company, Shanxi Aluminum Plant and the Lanzhou Aluminum Plant. Norsk Hydro is a major producer of bauxite, alumina, and refined aluminum products. The company, which employs 22,000 people worldwide, has plants in Rjuken, Raufoss, Vennesla, Karmoy, Hoyanger, Ardal, Sunndalsora, Holmestrand and Magnor (all in Norway). However, its major bauxite and alumina refining operations are in Brazil, which it acquired from Vale in 2011. Qatalum, located in Qatar, is a 50-50 joint venture with Qatar Petroleum and Norsk Hydro and has an annual capacity of 585,000 tons of primary aluminum. The company is also heavily involved in energy-related products. The company also owns a 50 percent share in Emirates Aluminum (EMAL) in Abu Dabi where production capacity is expected to reach 1.3 million metric tons by 2014. China Power Investment Corp. (CPI) is a comprehensive investment group that holds assets in power generation, coal, aluminum, railways and ports. Founded in 2002, the company has an installed aluminum production capacity of 2.77 million tons. Major aluminum assets include the Ningxia Qingtongxia Energy and Aluminum and CPI Aluminum International Trading Co. Ltd.
Shandong Xinfa Aluminum Group Co. Ltd. is one of China's largest private aluminum companies. Founded in 1972, the company now has over 50 subsidiaries and 15,000 employees working in power generation, alumina and aluminum refining, carbon production and downstream aluminum product manufacturing. Total primary aluminum production capacity is over 1 million tons per year and major assets include Chiping Huaxin Aluminum Industry Co. Ltd., the Shandong Xinfa Hope Aluminum Co. Ltd. (East Hope Group) and Guangxi Xinfa Aluminum Co. Ltd.
Aluminium Bahrain BSC (aka Alba) was founded in 1968 and produced a record 881,310 metric tons of primary aluminum in 2011. The company's product range includes extrusion billets, ingots, liquid metal and rolling slab. As of 2012, the company employed nearly 3,000 personnel.